Bring your inner artist into the modern age with this cool 3D Pen w/Free Filament! Quiet with a light and slim design, the iGrArK pen is easy to handle and features an extrusion speed button for smoother operation and endless creative projection possibilities. The 3D printing pen extrudes heated plastic which instantly hardens, allowing you to literally draw and transform images from your brain to the real world in 3D, freehand, or on paper. Draw horizontally or vertically to literally lift your imagination off the page! Great for improving spatial ability, abstract thinking, and creativity, the iGrArK 3D Pen makes a great gift for kids of all ages! 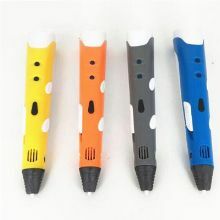 The 3D printing pen is suitable for children over 6 years old (with proper adult supervision) and is available in blue, yellow, grey, or orange. A free color filament chosen at random is included free of charge.